Ho Chi Minh, Vietnam to Siem Reap, Cambodia: Sickness, scams and the worst hostel of them all. – Where's Walton? Ho Chi Minh, Vietnam to Siem Reap, Cambodia: Sickness, scams and the worst hostel of them all. As I left Ho Chi Minh City I didn’t love or hate it all I know is that I felt relieved to go. However the weird and wonderful thing about this city is that I somehow managed to see about 60% of the people I had seen/met along the way down from Hanoi here in HCM. 🙂 I imagine it’s the same for people travelling upwards because most people do the same route with a 30 day visa. What I didn’t like about this city was feeling at ease all the time. When everyone tells you to watch your bag and not to bring out any valuables out it definitely makes you on edge and it’s then difficult to relax and take it all in. I did not take my camera out once and I wore my money belt religiously. I’m glad that I got to see the War Remnants Museum, this really needs to be seen by anyone visiting the city. Sadly it didn’t give me all the answers I was hoping for about the Vietnam War because it’s mainly photography and information about the the orange agent gases (It’s far to sad to talk about it, please just Google it). It was a big eye opener and a much needed education that will leave you wondering why and how could this happen?? It is very anti-American. Sadly the whole experience was then ruined at the end when I spotted a woman taking selfies and posing with various images and weapons. Not the time or place!!! 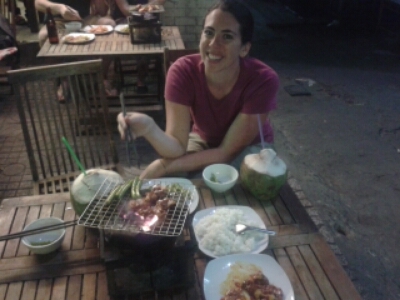 Another positive about HCMC was the food – finally some tasty Vietnamese food! I had a lovely meal out with the guys from my Mekong Delta tour where we had Beef Stew Noodles – Amazing! 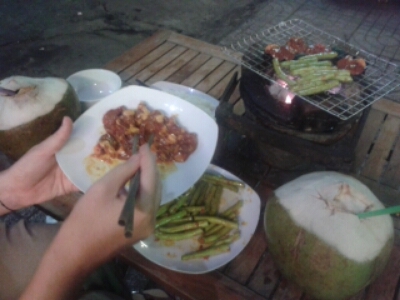 I also ate at a restaurant where you bbq your own food. When you board a 13 hour bus journey across the boarder by yourself, the last thing you want to feel is sick. But within an hour of boarding the nicest bus I’d been on with leather interiors and Wifi, the malaria tablet side affects started to take shape and I was violently dry heaving into a full packet of crisps, the only bag I had on me! Such a classy girl. What made matters worse was the guy in front of me was playing a Disney Frozen game…. so all I had in my head was the song “Let it goooo, let it go, can’t hold it back anymoooore!” No Anne, focus, do not be sick, they will kick you off the bus and keep you in Vietnam. Another an hour of Googling the side effects it started to pass and it was fine. 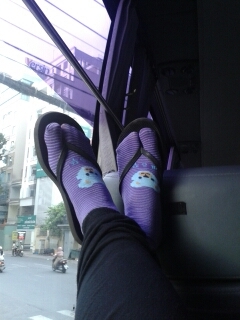 I even was rocking these amazingly bizarre/hideous socks I had seen all the Vietnamese ladies wearing. Total rock star. So crossing the boarder was pretty straight forward, especially as I was the only westerner on the bus. I was also slightly worried crossing over as I had no money left – I had planned my last few days to just have enough Vietnamese dong for food, hotel, travel and visa. So if anything went wrong, it could go very bad. On arrival to Phenom Penn I had one hour before taking another bus to Siem Reap… so I asked the transfer tuk tuk to stop by a cash point. I took out $100 thinking that seemed like a good amount for the next few days and expecting varieties of Cambodian Reil to come out, to my suprise popped out x1 $100 US dollars. What country am I in?? The tuk tuk driver then took me to a shop to get some change – but they refused it because it was too much money. Then conveniently the tuk tuk driver whipped out his wallet and conveniently whipped out lots of 20s, 10s and 5s change to swap for my 100. As we started to drive my mind began to wonder… had I just been scammed? have I just been hanged monopoly money? I’ve never used dollars! Why would a tuk tuk driver who gets paid roughly 1/2 dollars a journey through town conveniently have that kind of cash. As we pulled up to the station, I traded back. Not taking any risks!! 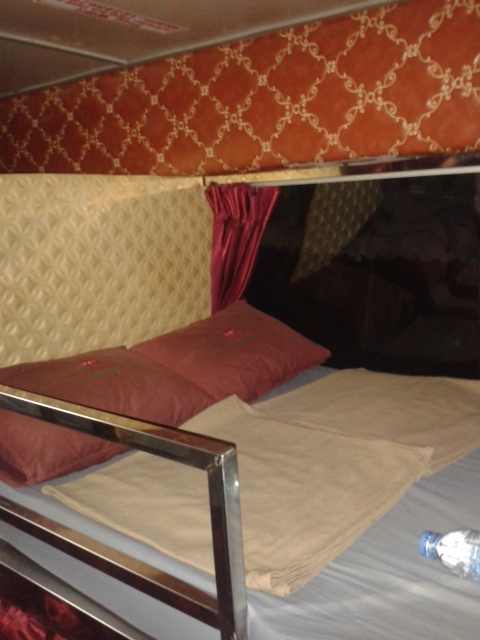 This was my bed for the night on a night bus. A double bed for two people. For those who saw my paniced Facebook status that night will know I was put in a bed shared with a Cambodian man in a mask. These beds were roughly queen size so it’s an awkward tight squeeze. I struck up conversation (as I presumed you would do before spending the night with a complete stranger). He didn’t want to talk to me. Typical man. However there was WIFI to keep me occupied. Luckily for me a sweet girl from Laos was feeling scared too so we teamed up and swapped a few people around and I shared with her. So it didn’t turn out too bad. Goodbye Vietnam!!! Hello Cambodia. Two months done, five to go. Anne, I don’t know whether I respect you for travelling on your own or feel utter horror. There is nothing you have said so far that would make me want to do the same.